What are these fast moving, small animals that first-time European and American visitors think are squirrels? 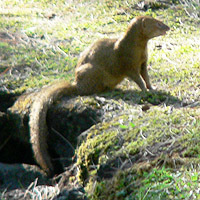 Since Hawai'i has no squirrels this must be our very own Rikky-Tikky-Tavi, the Small Asian Mongoose. Known also by it's Hawaiian name of 'Iole manakuke (or just manakuke), the word 'Iole means 'rat' and manakuke means mongoose. It is not easy taking pictures of mongooses (not mongeese :) - they are very small, sleek, and run at unbelievably fast speeds. They rarely spend much time in the open, preferring to dash from bush to bush. These photos were taken at MacKenzie State Park in lower Puna - where a quite distant mongoose was motionless enough for me to take these photos at maximum zoom. 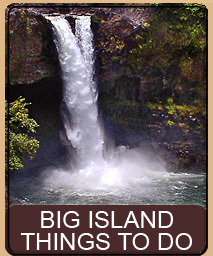 So how did this mammal get to Hawai'i? The 1800's were a huge century for sugar cane and plantations shot up on many tropical islands including Hawai'i and Jamaica. With sugar cane came rats, attracted to the sweet plant, which ended up causing quite a bit of crop destruction and loss. In 1872 a gentleman by the name of W. B. Espeut, in an attempt to control the rising rat populations introduced Small Asian Mongoose from Calcutta to the island of Jamaica. A subsequent paper published by Espeut, that praised the results intrigued local Hawaiian plantation owners who, in 1883, brought 72 mongooses from Jamaica to the Hamakua Coast here on the Big Island. These were raised and their offspring were shipped to plantations on other islands. 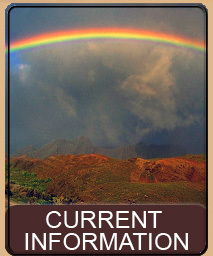 Currently, only the islands of Lana'i and Kaua'i are (thought to be) free of mongoose. 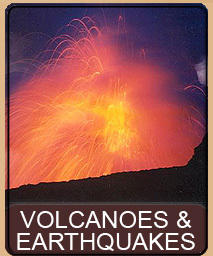 There are two conflicting stories of why Kaua'i was spared. 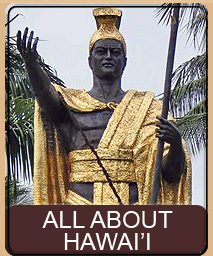 The first is that the residents of Kaua'i were opposed to having the animals on the island and when the ship carrying the offspring reached Kaua'i, the animals were thrown overboard and drown. A second story tells that upon arriving to Kaua'i one of the mongooses bit a dockworker who, in a fit of anger, threw the caged animals into the harbor to drown. So just what is the problem with mongooses? Well, for one, they are active mostly during the day, whereas the rat is active at night - so while they did eat some rats, they had very little impact on the overall rat population. 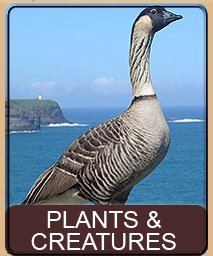 More importantly, however, was the fact that the mongoose have a taste for birds and especially bird eggs. 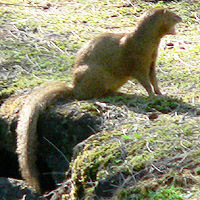 While the rat was already endangering native populations of ground nesting birds, bringing the mongoose only added to the problem. The normal diet of a mongoose is largely made up of insects, but also includes small cats, snakes, frogs, rodents, seeds, nuts, fruit and, of course, the delicious egg. To top it off, male mongooses can father offspring in as little as 4 months after birth - with the female producing a normal litter of 2 to 5 pups per year. Though cute and playful, these pups will soon be parenting more and more mongoose. Additionally, both rats and mongooses carry leptospirosis which their droppings transfer to our streams and water supplies, so not only are these creatures destroying native birds, they also threaten human habitats (and is one good reason not to swim in Hawai'i streams and ponds). 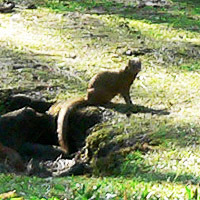 Unlike India, the natural home to these creatures, Hawai'i has no natural predators to the mongoose. 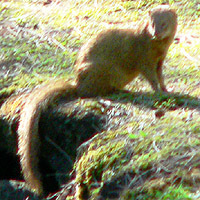 Mongoose control must be done by humans, usually by trapping. However, very little animal control goes on except for the occasional mongoose run over by a car (apparently, in order to turn their head and look, they have to stop running, which means beeping your horn at a mongoose crossing the road is a good way to get him to stop and pose for a hit-and-run). Rumor has it that My Island Bed and Breakfast in Volcano Village used to give a free night's stay for anyone who could bring in a dead mongoose that has been run over. The catch? The treads in the mongoose had to match the treads on your car (our recommendation would have been to simply run over them again :). However, upon calling My Island Bed and Breakfast the person who answered said that if it was a policy, she was pretty certain it no longer was. Regardless of how cute and loveable (appearing) these animals are, they are not welcome in Hawai'i and if you have them on your property you should take steps to control the population. Wait! What was that sound! Never mind, move along, nothing to see here folks. 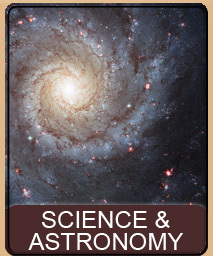 This page is named 'Animals.mongoose'. Can't Find It?